The high-octane Patriots’ offense sputtered. Le’Veon Bell had ten carries, just two more than the career-low eight carries he saw once, back in 2014. The rookie running backs to own in Week 1 were Kareem Hunt and Tarik Cohen. Bennie Fowler was a fringe WR1. The Rams defense scored more fantasy points than all but three quarterbacks. We lost David Johnson to, of all things, a wrist injury. Week 1 went EXACTLY how we expected it to, didn’t it? This is why we love and play this game. The variance makes us sweat and the sweat makes us tilt. We love torturing ourselves. Once 1PM on Sunday hits, we know nothing. It is the preparation and work leading up to kick off that we spend hours on during the week, but once that ball gets kicked and the clock starts, football takes over and we are left with trusting our processes. Week 1 was FLUKEY, wasn’t it? •	If DeAndre Hopkins league-high 16 targets don’t impress you enough, his 50% target share should. Of those 16 targets, 11 of them came in the second half when rookie quarterback DeShaun Watson came in the game (h/t @RIPatriot for pulling those numbers for me). Hopkins faces the Cincinnati Bengals tonight, who gave up 17.1 fantasy points to Rams’ receivers last week. Watson is starting for the Houston Texans. •	Amari Cooper trailed Hopkins in targets with 13, along with Larry Fitzgerald and Randall Cobb. Cooper’s 41% team target share was second best among receivers, however he led his peers with an embarrassing 44.4% drop rate. 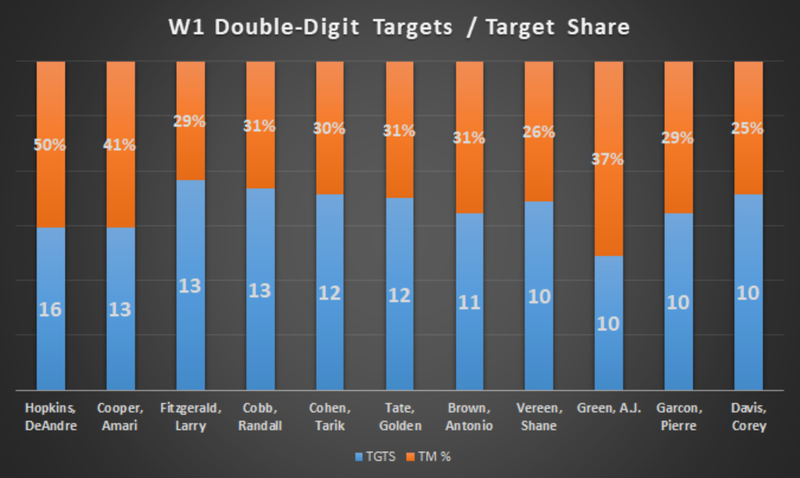 •	With Odell Beckham sidelined, Shane Vereen led all New York Giants with ten targets and is the only running back in the double-digit target tier. Beckham is expected back this week. Regardless, Vereen’s usage makes him far and beyond the back to own in New York, and gets the Detroit Lions this week, who gave up a combined 30 fantasy points to running backs last week. 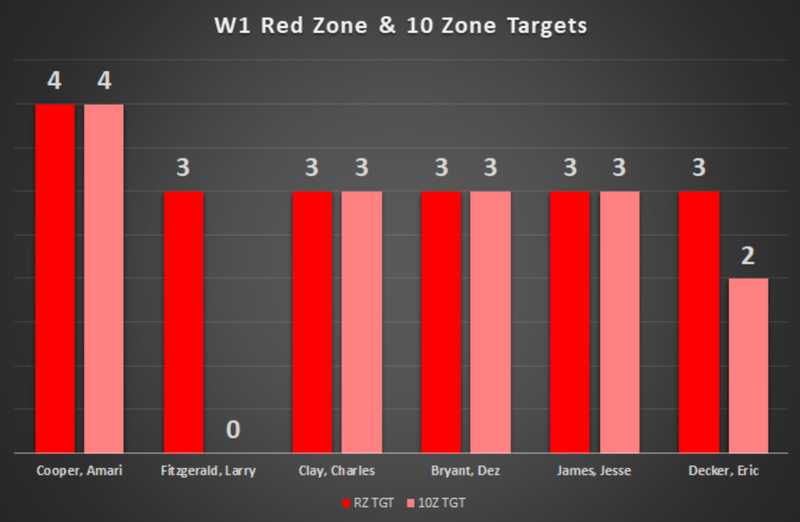 •	The red zone is where the magic happens, and here are your red zone target leaders, 10 zone included. •	That drop 44.4% drop rate I mentioned for Amari Cooper is displayed above. All four of his drops in Week 1 came not just in the red zone, but from the 10 zone (goal line situations). To be clear, these are drops, not passes that sailed over his head. If we can look past the case of the dropsies and keep our eyes on the usage then we can see the dollar signs against the New York Jets this weekend for Cooper. •	Charles Clay, Dez Bryant, and Jesse James were also the goal line receivers in their offense. While Clay and James scored, Bryant was held in check by Janoris Jenkins. The internet’s favorite cornerback-sensitive receiver faces Aquib Talib this week and Patrick Peterson next week. If he can haul in one of these 10 zone targets we can anticipate, he can kill the narrative of being menaced by lockdown corners. If not, look ahead to games against the Los Angeles Rams, Green Bay Packers, and San Francisco 49ers before he faces frenemy Josh Norman on the road in Week 8. •	The Green Bay Packers (82) and the New England Patriots (81) are the only teams that ran over 80 offensive plays in Week 1. Jordy Nelson (92%), Ty Montgomery (90%), Rob Gronkowski (96%), and Chris Hogan (90%) were all on the field for at least 90% of their teams’ snaps. o	Nelson has scored in 12 of his past 17 games, including the playoffs. That should continue this week on the road against the Atlanta Falcons. This game has the second highest point total of the weekend at 53.5 with a 25.5 implied total for the Packers. o	There is not a running back in football that saw more overall opportunity than Montgomery when we factor in his team snap %, targets (4), receptions (4), and carries (19). The Falcons just surrendered eight receptions and a receiving touchdown on 12 targets to Tarik Cohen. Assuming Montgomery is a better running back than Cohen (he is), he should shatter the Falcons defense this weekend. o	We never have to decide on Rob Gronkowski on a weekly basis but Chris Hogan does require a decision. Held to just a catch, we should still be encouraged by the amount of time he spent on the field and his 15% target share. Anyone who watched that game saw a few deep passes sail over his head. Take advantage of recency bias and roll out Hogan, who should see low ownership in tournaments, against the New Orleans Saints this week. The 54.5 point total, which I am betting the over on, for this game is the highest on the slate. We are at the point where I preach a bit about the importance of using our stat and tool pages linked above to your own advantage. Make a simple spreadsheet using our data and throw some filters on there. This allows you to interpret the numbers and draw your own conclusions. All I can do is share with you the handful of things that stick out to me among the countless data points you can find. Good luck this weekend and, as always, feel free to reach out for anything on Twitter @FFdeJENerate.